Gedu Andargachew commanded very well his first town hall meeting. Gedu Andargachew during the town hall meeting in Washington DC. Gedu Andargachew and his entourage held its first town hall meeting with Ethiopians in Washington DC area yesterday, a day after their arrival. Gedu, who is the president of Amhara regional state, and his colleagues faced questions on matters relating to Ethio-Sudan border, identity questions relating to Wolkait and Raya, national unity, water hyacinth challenges of Lake Tana, peace and campaign against Khat addiction. They seem to have addressed them to the satisfaction of the audience. On the issue of Ethio-Sudan border, Gedu reminded the audience that there is consensus about it in the government and that is is working on it. As to the identity questions in Wolkait and Raya, he explicitly said that his administration is pursuing it though legal means. He stressed importance of peaceful approach to it. He told the audience that the question will be addressed no matter how long it takes. Regarding Khat, which has become one of the factors for social crisis, especially among the youth, in the country with a negative impact on cultural and political aspects of life, Gedu stated that there is awareness and that the administration has started acting on it with the objective to eradicate consumption of it from the country. Farmers who depend on the production of it for their livelihood will in the long run be given alternatives. Unlike the case of Ethiopia and some countries in the horn of Africa, Khat is illegal in many countries. Gedu also seized the opportunity to thank Ethiopians for their contribution in the fight against water hyacinth. Ethiopians in the United States raised funds for the purchase of removal machine in January of 2018. He added that government will use all the means in its power to make sure that Lake Tana, which he described as of great historical significance, is free from water hyacinth. On political questions involving identity and relation with Tigray, leader of the deligation offered a sound response. Asked what he makes of Debretsion’s alleged remark “better to live with Sudanese who cut of Emperor Yohannes IV’s head rather than living with Amharas,” Gedu answered that he does not know if he said that or not. “If I was asked whether I prefer to live with Sudanese or Tigreans, I would say thousands of folds times that I prefer to live with Tigreans,” Gedu said to the applause of the audience packed in the hall. As well, he addressed questions regarding power distribution after the onset of reform in the country some seven months ago. The questions as to who, implying ethnicity, has more power and who is holding what positions are short of understanding the purpose of ongoing change, he added. It is about creating democratic Ethiopia livable to all its citizens and “You should support us in the struggle to make the change take root ” Gedu told the audience. 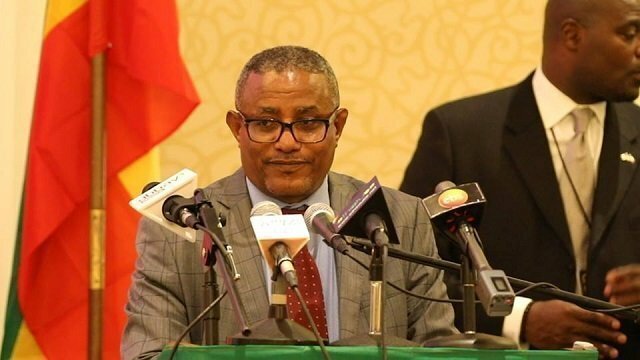 Dr. Ambachew, who is member of Gedu’s team, on his part underscored that the change in the country has reached to a point that it will not be reversed but it does not mean that it is complete, the very reason that needs the support of all Ethiopians including those outside of Ethiopia, according to him. The delegation held meetings with activists today at the Ethiopian Embassy in Washington and they will have town hall meetings in three other towns in the coming days.